Hello everyone! 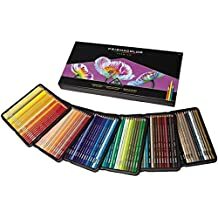 Another dailymarker30day challenge started and I picked the prismacolor pencils for my first project during the challenge. 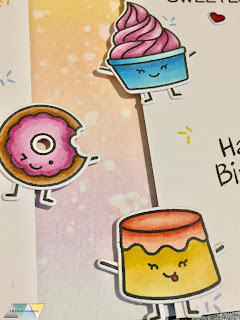 I used the sweet stamps from 'under the weather' from Cleary Besotted and stamped them onto white cardstock. After coloring the images I diecut the pieces with Lawn Fawn 'fancy scalloped circle stackables' and colored them as little flowers. I created a quick watercolor background with dried marigold and wild honey distress ink. I added the flowers with foam tape and drew some stems. I added a sentiment from a retired Clearly Besotted stamp set (Brushed greetings) and chose a metallic green card base. Although I don't buy that many Lawn Fawn stamp sets as before I couldn't pass the new 'sweet friend' set. I think this set is soo much fun, especially the hands and legs you can diecut for the deserts too. I startet by inking up a strip of watercolor paper with colorful distress inks. I used squeezed lemonade, dried marigold, tattered rose, spun sugar, milled lavender and tumbled glass. I also sprinkled some waterdroplets. Then I stamped all the sweet images with Memento tuxedo black and colored them in with Copics. I prepared two withe strips of cardstock and adhered them to black fun foam. Then I added the sentiment and some sprinkles. 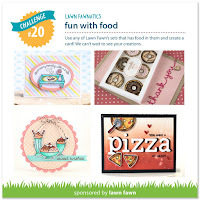 For the sprinkles I used the Lawn Fawn dye inks sunflower, ballet slipper and moonstone. For the sentiment I used black licorice. 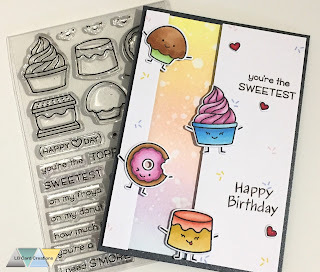 I adhered the paper with the black fun foam and all the images and decided to add another sentiment so that I can use it as a birthday card. 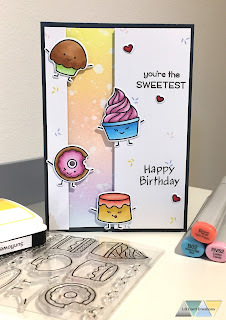 I went with the birthday sentiment from the 'bake me a cake' stamp set from Lawn Fawn. Thank you so much for stopping by and have a sweet day!